The cartwheel effect is a term that describes the rotating, windmill-like effect of light that mint state coins exhibit. The cartwheel effect is best known for appearing on Morgan and Peace silver dollars, due to the basically flat design of the coins, large planchet size, and die preparation methods. However, you can observe the effect on any mint state coin. Flow lines that occur during the coin striking process cause the cartwheel effect by reflecting the light off the surface of the coin. The effect is somewhat fragile, and will disappear as a result of circulation or if the coin is cleaned. Coin collectors also refer to this as "mint luster." This word is not to be confused with the coin collecting term "cartwheel" that is a slang term for large American silver dollar coins, usually a Morgan silver dollars. People used the term mostly in the late 1800s and the early 1900s. Very few people refer to silver dollars as cartwheels anymore. Obtain an uncirculated coin. 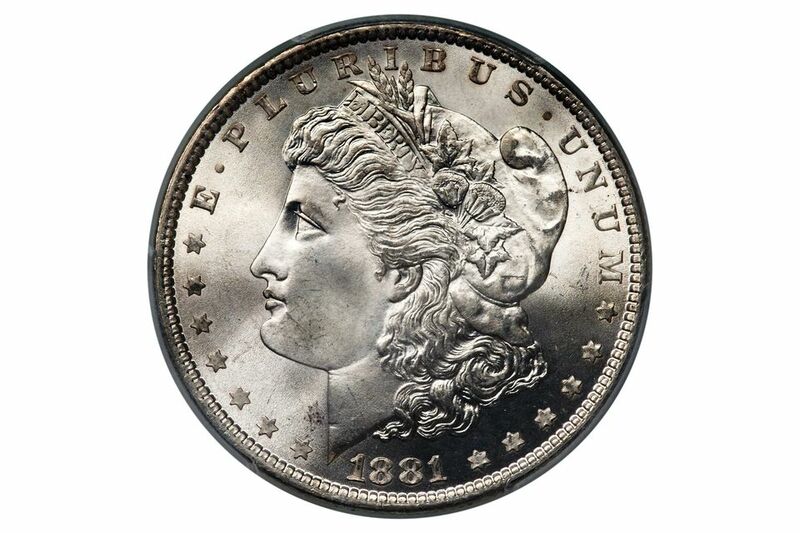 Large silver dollars such as the Morgan or Peace Silver dollars will show the cartwheel effect most easily. Use a desk lamp or other single bulb lamp in a dark or dimly lit room. Other light from fluorescent lights or windows may make the cartwheel effect harder to observe. Hold the coin approximately 18 to 24 inches underneath the lamp. Tilt the coin at various angles to the light. You should see a pattern of rotating lighter versus a darker reflection of the light against the coin's surface as you tilt the coin. The cartwheel effect doesn't necessarily appear on all mint state coins since the effect is dependent on various factors that come together during striking. The cartwheel effect is an important part of determining the condition or grade of a coin. As a coin circulates in commerce, the highest points on the coin will come in contact with other coins and surfaces that will obliterate the flow lines that cause the cartwheel effect to appear. With the flowlines obliterated the cartwheel effect will not be present in those areas of the coin. The lack of mint luster on the highest points of the coin is one of the first indications that a coin has seen circulation in commerce and therefore cannot be classified as uncirculated. Additionally, since the microscopic flowlines that cause the cartwheel effect are extremely delicate continuous chemical cleaning or some other abrasive type of cleaning of the coin will damage or obliterate these flowlines. Therefore, a coin may seem uncirculated because all of its details are still intact, but improper cleaning has destroyed the flowlines, and hence the cartwheel will no longer be observable on that coin. Proof coins are minted using a special process that involves specially prepared dies and polished coin planchets. The field of the coin is usually mirror-like, and the devices are frosted. On reverse Proof coins, the field is frosted, and the devices are polished to a mirrorlike reflectivity. Before 1972, only the first hundred Proof coins from a fresh set of coin dies had this frosted and mirrorlike surface combination. As the coin dies continued to be used, the microscopic frost would deteriorate into the highly polished reflective surfaces. Additionally, the tremendous pressure used in striking Proof coins led to microscopic striations across the field and devices on the die. The striking process would then transfer these striations to the Proof coins. Therefore, you can see the cartwheel effect on Proof coins given the proper lighting conditions. However, it is not blatantly obvious like it is on an uncirculated coin. Additionally, the very first coins will have no striations at all, and it will be impossible to see the cartwheel effect. The existence of these microscopic striations across the surface of a Proof coin is more of an indication of a coin die in the later stages of its useful life. What is a Cud Error on a Coin? What are Bag Marks on a Mint U.S. Coin? What is a Business Strike Coin?